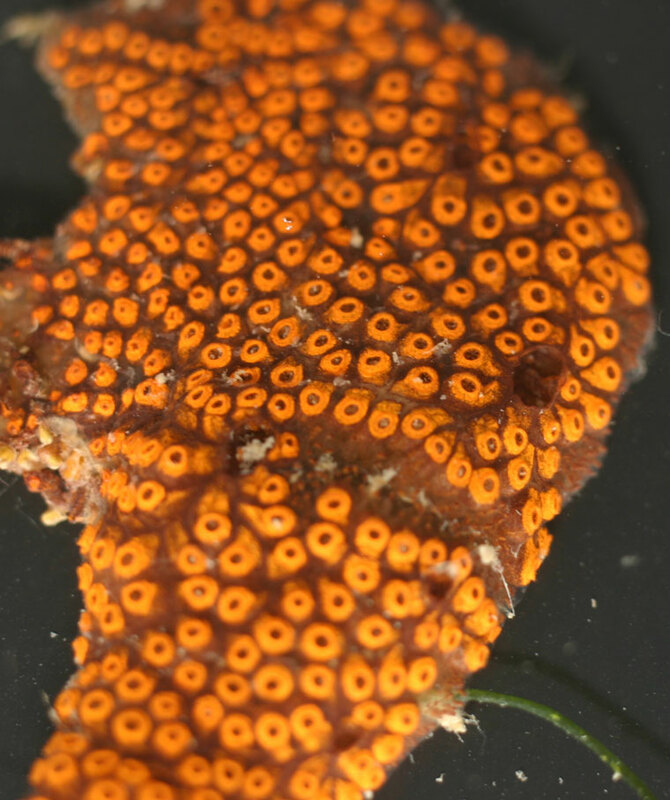 Botrylloides violaceus is a colonial sea squirt that forms flat sheets that are irregular in outline and adhere to the substrate, with large colonies reaching up to a third of a meter or so in diameter. It grows on a variety of surfaces, include docks, boat hulls, buoys, ropes, pilings, the undersides of rocks, eelgrass (Zostera marina) blades and seaweeds. 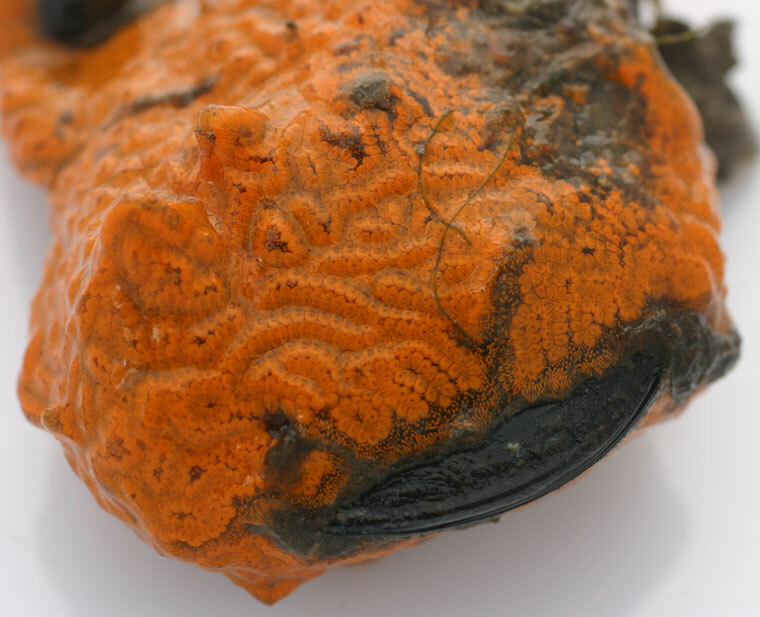 It often overgrows mussels, barnacles, encrusting bryozoans and solitary sea squirts. Each colony consists of many small individuals called zooids, that are arranged in elongated clusters called systems, within a firm, often clear matrix. These systems are in the shape of long ovals or meandering, occasionally branching, double-rows or chains. Each zooid pumps water through its body, filtering out food particles. As described below, the zooids in a system discharge their filtered water into common spaces from which it exits the colony. A system may consist of dozens of zooids, which are oval or teardrop-shaped and about 1-2 mm long when viewed from above. Each zooid is a single color, and all the zooids within a colony are the same color, usually orange, yellow, red, purple or tan, and occasionally brown or lavender. The matrix is usually clear, though in some older colonies it can be the same color as the zooids. Networks of transparent blood vessels running through the matrix have numerous dead ends that are visible as small pigmented blobs the same color as the zooids, embedded in the clear matrix between the systems and around the edges of the colony. The following details can be seen with a microscope and some dissection. At the top of each zooid there is a small opening, called the oral aperture, with 16 small tentacles around the inside of the opening. Water enters through this opening into a sac that occupies much of the zooid's interior. The sac is pierced with holes, called stigmata, that are arranged in 10-12 horizontal rows, with the second row from the top being significantly shorter than the others. As water passes through the stigmata, the zooid captures food particles and absorbs oxygen. The water leaves the zooid through another opening called the atrial aperture, with the atrial apertures of several zooids discharging into a common space within the double row of zooids from which the water then exits the colony. Eggs are incubated in brood pouches that protrude from the zooids into the matrix, with 1 egg per pouch and 1 or 2 pouches per zooid. The eggs develop into relatively large (about 1 mm in body diameter) tadpole-shaped larvae with 24-34 finger-like buds, called ampullae, on the head end. When released from the colony a larva spends less than a day in the water column before attaching head-down onto a firm surface. The settled larva metamorphoses into a zooid, which buds others off to the sides to form a colony. Botrylloides violaceus has been found over a salinity range of 26-34 ppt and a temperature range of 8-25° C.
In Botrylloides species, the zooids are arranged in elongated ovals or meandering double rows, with water exiting from spaces between the rows; while in the Botryllus species found on the Pacific Coast, the zooids are arranged in circular, oval or star-shaped clusters, with water exiting from a space in the center of the cluster. In some Botrylloides specimens, there are oval islands of matrix left between the double-rows, which can look like oval systems, except that the narrow ends of the teardrop-shaped zooids (where the water is discharged through the atrial apertures) point away from the center of the oval islands and toward the center line of the double row of zooids, while in an oval system they point toward the center of the oval. In addition, small pigmented blobs that are the ends of blood vessels are sometimes visible in the center of these ovals, indicating that they are islands of matrix rather than the centers of systems. The larvae of Botrylloides violaceus, with 24-34 ampullae, can also be distinguished from those of the common species Botryllus schlosseri, which have 8 ampullae. 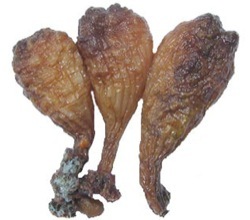 Two other species of Botrylloides are known from the Pacific Coast. 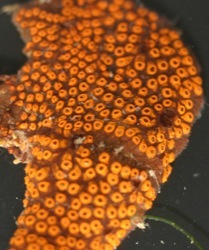 In Botrylloides diegensis, which has been reported from northern Baja California to San Francisco Bay, each zooid usually has two colors, with a bright or pale white, yellow, orange or greenish ring around the oral aperture contrasting with the zooid's overall darker color (though this may not be apparent in some orange specimens). There are 10-12 complete rows of stigmata in the interior sac. The larvae are relatively small, have 8 ampullae, and are incubated inside a living adult zooid. These features are in contrast to Botrylloides violaceus' single color, incomplete second stigmata row, and larger larvae with 24-34 ampullae incubated in a brood pouch. Botrylloides perspicuum, a recent introduction reported in San Diego and Mission bays, has a much thicker and firmer matrix, with ridges that separate groups of zooids, 18 stigmata rows, and larvae with 8 ampullae—in contrast to Botrylloides violaceus' flat colonies, 10-12 stigmata rows, and larvae with 24-34 ampullae. Japan and southern Siberia to southern China. Botrylloides violaceus has been collected throughout Puget Sound from the Canadian border to Totten Inlet in the south, and in the San Juan Islands. In San Francisco Bay, it has been collected from the near the mouth of the Bay to Point San Pablo in the north and Redwood Creek in the south. The first clear Pacific Coast records of Botrylloides violaceus are in the 1970s in San Francisco Bay, Willapa Bay and southern Puget Sound, but due to limited collecting and confusion with similar species it could have been common at many Pacific Coast locations for at least several decades earlier. In southern California, Botrylloides violaceus was not distinguished from the similar, co-occuring species Botrylloides diegensis until 1997. However, Botrylloides violaceus was likely observed in southern California in the 1970s, and populations reported by Van Name in 1945 as Botrylloides diegensis (and possibly referring to much earlier collections) may also have included Botrylloides violaceus. It is common on both shells and boat hulls, and could have been introduced either with Japanese oysters (Crassostrea gigas) or in hull fouling. Since its larvae spend less than a day in the plankton before settling, transoceanic transport in ballast water is unlikely, although small colonies could be carried in ballast tanks on bits of floating debris. Cohen, A.N. and J.T. Carlton. 1995. Nonindigenous Aquatic Species in a United States Estuary: A Case Study of the Biological Invasions of the San Francisco Bay and Delta. U.S. Fish and Wildlife Service, Washington, DC (pp. 111-112). Lambert, C.C. and G. Lambert. 1998. Non-indigenous ascidians in Southern California harbors and marinas. Marine Biology 130: 675-688. Lambert, C.C. and G. Lambert. 2003. Persistence and differential distribution of nonindigenous ascidians in harbors of the Southern California Bight. Marine Ecology Progress Series 259: 145-161. An orange Botrylloides violaceus colony on a bay mussel (Mytilus trossulus-galloprovincialis complex) in San Francisco Bay. Note the meandering double rows of zooids that are characteristic of this species. A Botrylloides violaceus colony in which many of the zooids appear to be in oval systems like those in Botryllus schlosseri. However, the narrow ends of the teardrop-shaped zooids point away from the ovals, and the ends of blood vessels appear as small blobs within the ovals (see enlarged image). Botrylloides violaceus colonies of several different colors growing on a tire hanging from a dock in Willapa Bay, Washington. Orange and red colonies of Botrylloides violaceus growing on ropes in Tomales and San Francisco bays. A yellow sponge (Halichondria bowerbanki) and a tan bushy bryozoan (Bugula sp.) 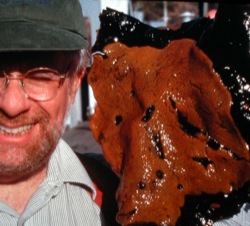 are also present in the right-hand photo. 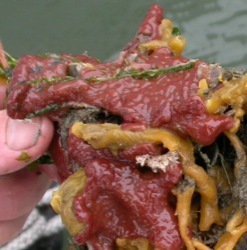 A red colony of Botrylloides violaceus overgrowing the sponge Halichondria bowerbanki in San Francisco Bay. 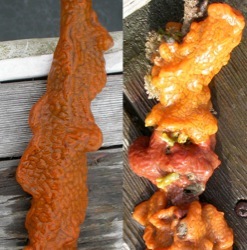 A large orange colony of Botrylloides violaceus growing on seaweed in Puget Sound. 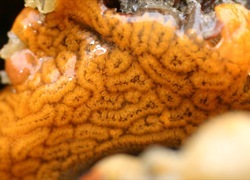 Closeup of a small tan colony of Botrylloides violaceus, growing on a solitary sea squirt Molgula manhattensis, in San Francisco Bay. 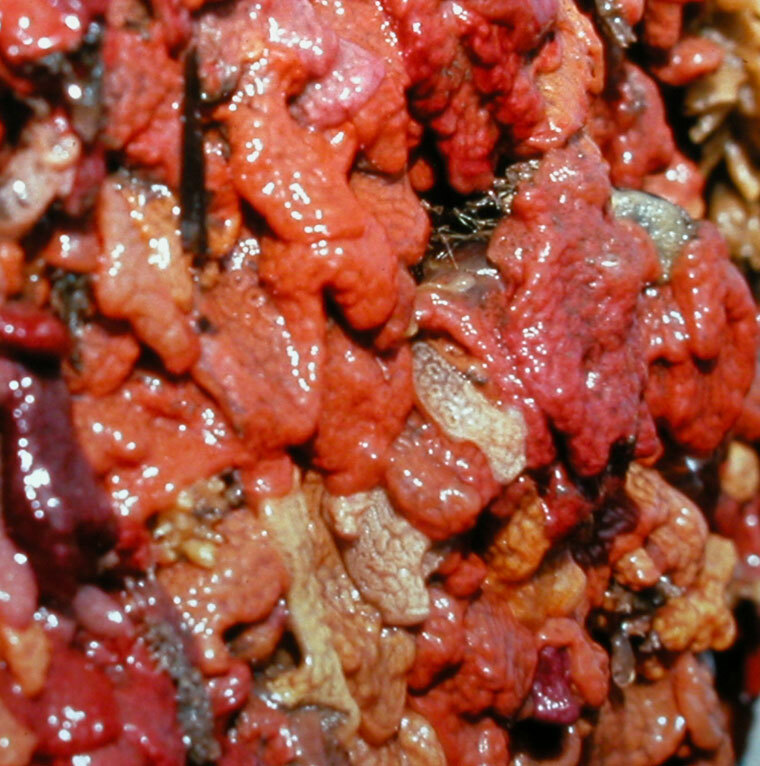 The pigmented ends of numerous blood vessels are visible along the right side of the colony. 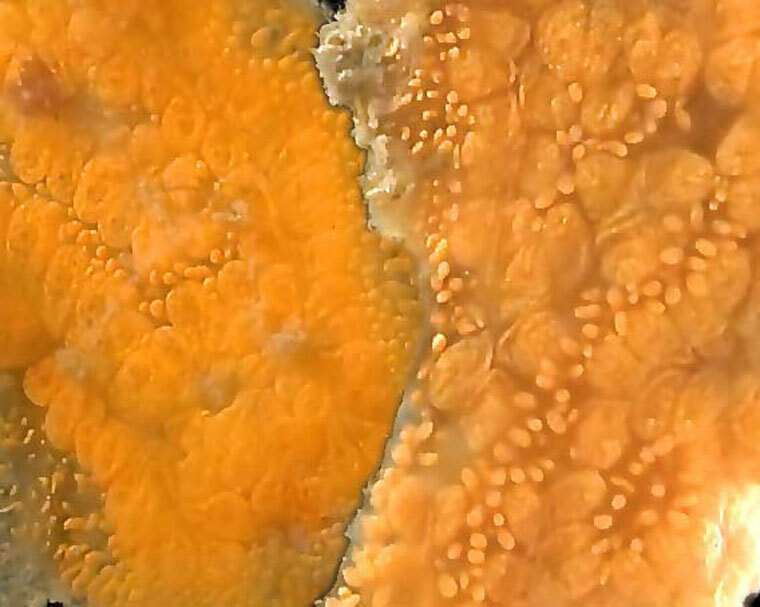 Closeup of two adjoining colonies of Botrylloides violaceus in San Francisco Bay. The pigmented ends of blood vessels are visible between the zooids. 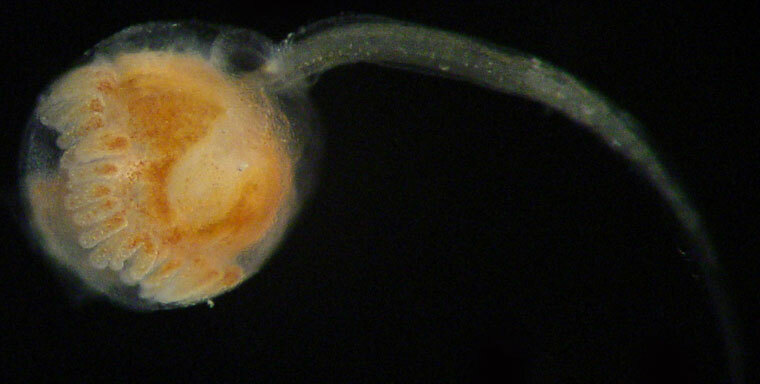 A Botrylloides violaceus larva. 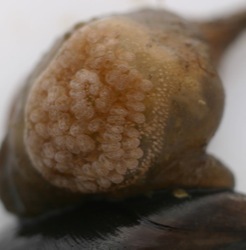 Note the large number of fingerlike larval ampullae (about 18 visible in the photo) on the head (at left in image). 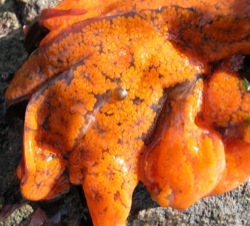 Closeup of an orange colony of Botrylloides diegensis in San Francisco Bay.